GH3C-282 | Size: 50 ml / 1.69 fl.oz. An intensive retexturizing moisturizer that repairs skin overnight for a beautiful, well-rested appearance. Thanks to a complex of natural oils (Soy, Avocado, Squalane, Shea Butter) and Hyaluronic Acid it offers mature and dry skin optimal nutrition and hydration, restoring the hydro-lipid barrier protection. Sepilift gives a lifting effect, while Vitamin E fights against effects of free radicals. Juvinity™ visibly reduces the appearance of wrinkles, improving elasticity and smoothing skin. • Elasticity increased up to 42.37%. • Anti-wrinkle effect increased up to 43.37%. Avocado Oil - Has rejuvenating, emollient, healing and nourishing effects. Sepilift - A special ingredient capable of regenerating elastic fibers of the epidermis. Squalane - Has emollient properties that soften and soothe skin. Vitamin E - A very effective antioxidant; helps cell regeneration and removes the formed “free radicals”. INGREDIENTS: AQUA, GLYCINE SOJA OIL, CETEARYL ALCOHOL, CETEARETH 20, GLYCERYL STEARATE , GLYCERIN, PERSEA GRATISSIMA OIL, SQUALANE, BUTYROSPERMUM PARKII BUTTER, DIPALMITOYL HYDROXYPROLINE, CAPRYLIC CAPRIC TRIGLYCERIDE, GERANYLGERANYLISOPROPANOL, POLYACRYLAMIDE, C13-14 ISOPARAFFIN, LAURETH-7, TOCOPHERYL ACETATE, SODIUM HYALURONATE, PHENOXYETHANOL, METHYLPARABEN, ETHYLPARABEN, PROPYLPARABEN, BUTYLPARABEN, PARFUM, TETRASODIUM EDTA, SODIUM HYDROXIDE, BHA. Leaves perfectly clean, soft, and reinvigorated skin. 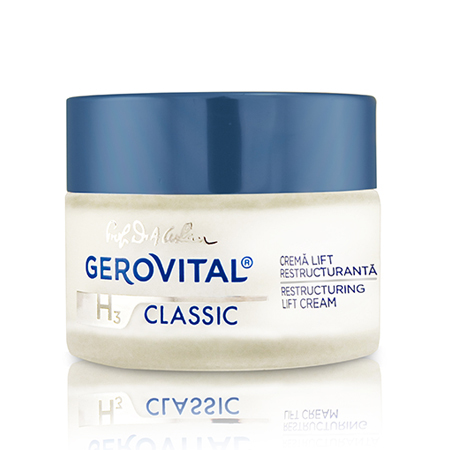 A rejuvenating hydrator that softens and firms.